Our large apartments with private balconies are popular with families and can sleep up to 5 people. Each apartment is furnished in a simple island style, with original artworks and contemporary furnishings. Situated on the upper floor, the rooms are all very large and comfortable with plenty of natural light and fantastic sea views. Our open plan apartment comes with a large bedroom, with a double bed plus a single bed. There's a kitchen fully equipped for families, leading on to a lounge area with a double sofa bed and a family dining table. There's A/C, WI-FI & a two private bathrooms. 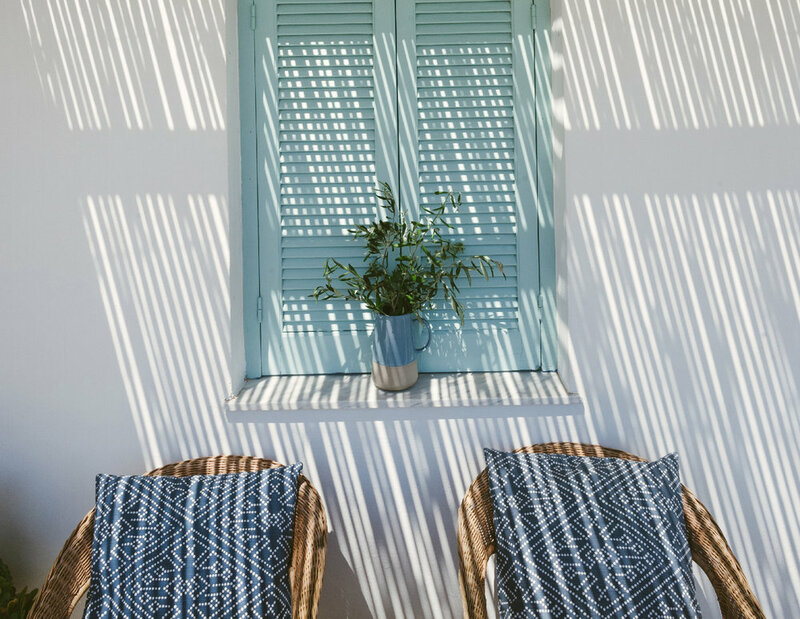 You can enjoy the wonderful views of Panteli Bay from your own private terrace, with comfortable outdoor furniture and a small Mediterranean style garden. We offer our guests a daily breakfast served in your room with fresh, home-made, local produce at an additional cost. Fully equipped family kitchen with sink, hob, kettle and refrigerator / Large Private gated balcony - with family dining area. Extra bed is available at additional cost.